On the weekend of October 31–November 1, 2015, the community of St. Vladimir’s Orthodox Theological Seminary [SVOTS] gathered to honor its heavenly patron, the Great and Holy Prince Vladimir, by commemorating the translation of his holy relics to Three Hierarchs Chapel. In November 2013, a delegation from the Ukrainian Orthodox Church, Moscow Patriarchate, led by His Eminence, Metropolitan Philip of Poltava and Myrhorod, presented the community with the relics of Saint Vladimir and a rare Book of the Gospels. The precious gifts were presented on behalf of His Beatitude, Metropolitan Volodymyr of Kyiv and All Ukraine, who reposed in 2014. Vladimir Sviatoslavich the Great was the prince of Novgorod, the grand prince of Kyiv and ruler of Kievan Rus’ from 980 to July 15, 1015. Saint Vladimir introduced Orthodox Christianity to Kyivan Rus’ in the year 988. Orthodox Christians around the world have organized events in 2015 to commemorate the 1000th year anniversary of the blessed saint’s repose. The weekend’s events began with the celebration of a beautiful Vigil on Saturday evening, sung antiphonally by the Saint Damascene and Saint Cassia chapel choirs. Metropolitan Tikhon, Primate of the Orthodox Church in America and President of the seminary, presided at the celebration of the Divine Liturgy on Sunday morning. 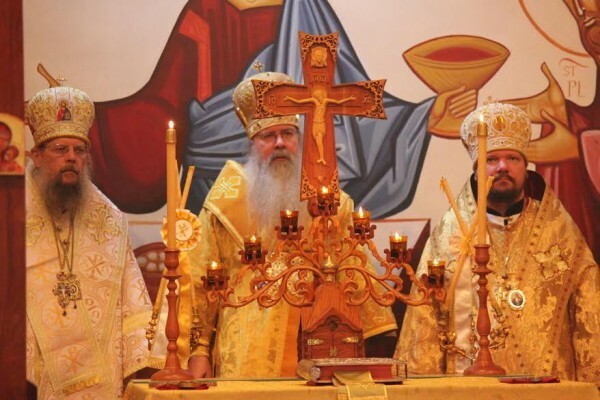 Concelebrating were His Grace, Bishop Alexander of Toledo and the Bulgarian Diocese of the OCA, and His Grace, Bishop John of Naro-Fominsk and Administrator of the Patriarchal Parishes in the USA. The community continued its joyous celebration that evening with a cherished—and delicious—Saint Vladimir’s tradition: a pre-Nativity Fast Thanksgiving dinner. Seminarians, faculty, and staff, and their families enjoyed a delightful feast prepared by Chef Nat Fasciani.